The Blackbird is Sweden's national bird. The Blackbird (Turdus merula) is in Europe, the most common representative of the thrushes. Its range extends into the Middle East and China. 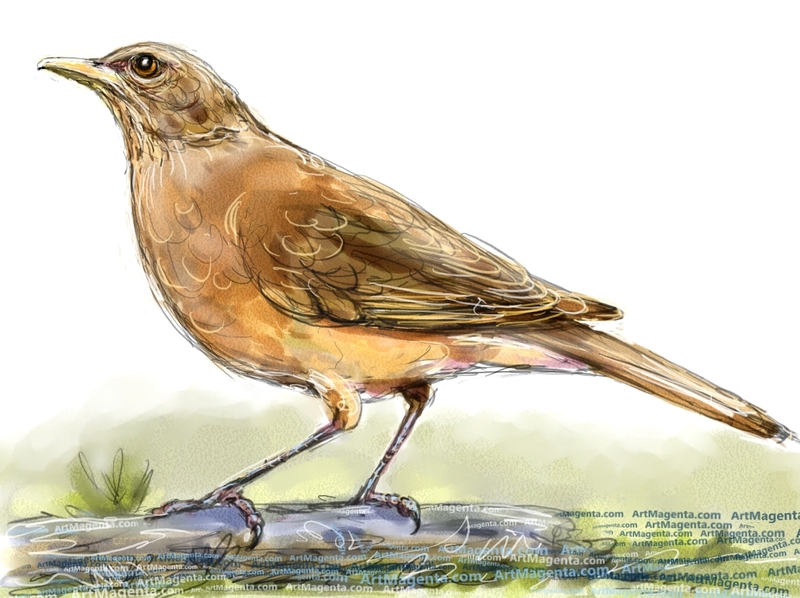 TAGS: Bird painting of Eurasian Blackbird, bird sketch of Eurasian Blackbird, bird drawing of Eurasian Blackbird, bird art of Eurasian Blackbird, bird illustration of Eurasian Blackbird. The Hermit Thrush (Catharus guttatus) breeds in coniferous forests of North America and in the fall it moves to wintering sites in southern United States and Central America. TAGS: Bird painting of Hermit Thrush, bird sketch of Hermit Thrush, bird drawing of Hermit Thrush, bird art of Hermit Thrush, bird illustration of Hermit Thrush. The American Robin (Turdus migratorius) lives in all of North America, from Mexico to northern Alaska. 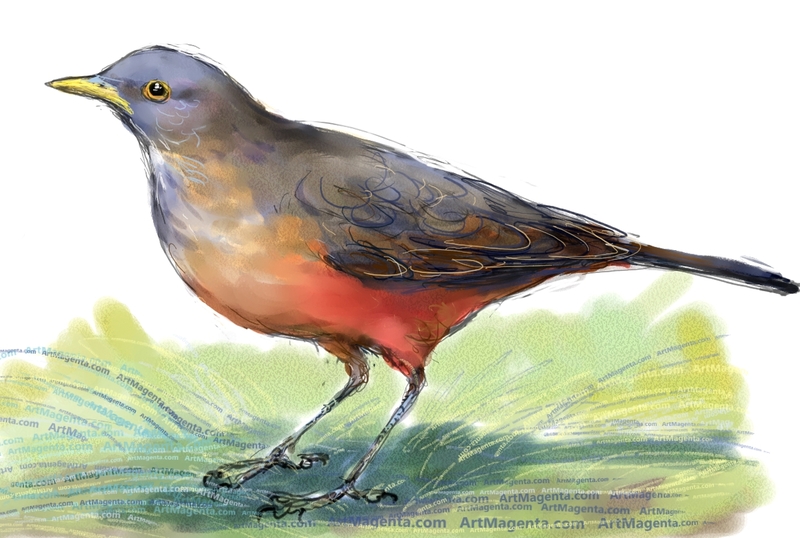 TAGS: Bird painting of American Robin, bird sketch of American Robin, bird drawing of American Robin, bird art of American Robin, bird illustration of American Robin. The Redwing (Turdus iliacus) nests in pine and birch forest on the tundra in northern Europe and Asia, but it also occurs regularly as a breeding bird in most types of forest environments. The redwing is mostly migratory, and migrates south in winter. It breeds very rarely in Britain and Ireland, but often winters there. The Mistle Thrush (Turdus viscivorus) breeding in the Western Pale arctic up to the Arctic Circle. It occurs from northwest Africa, Morocco, Algeria and Tunisia on through most of Europe, east through Russia to western Siberia, through Kazakhstan, Iran, Afghanistan, Pakistan, India, Nepal and China. Parts of the global population is sedentary, while the northernmost breeding areas are abandoned in winter. The Fieldfare (Turdus pilaris) nests in northern Europe, south to southeastern France, northern Italy, Slovenia and Croatia, to the east by Russia and northern Ukraine to the river Aldan in eastern Siberia, south to the northernmost part of Kazakhstan, Altajbergen, Sajanbergen and Lake Baikal. Song Thrush (Turdus philomelos) occurs in large parts of the Palaearctic as far east as Lake Baikal. It is partially migratory, and many birds are wintering in southern Europe, North Africa and the Middle East. The song trush has also been introduced to New Zealand and Australia. The Ring Ouzel (Turdus torquatus) appears in light coniferous forests in mountainous areas in most parts of Europe and western Asia, especially in the Alps, in the UK and in the mountain regions in Scandinavia. The clay-colored thrush (Turdus grayi) is a common Middle American bird of the thrush family. It is the national bird of Costa Rica, where it is well known as the yigüirro. Other common names include clay-colored robin. The rufous-bellied thrush (Turdus rufiventris) occurs in most of east and southeast Brazil from Maranhão south to Rio Grande do Sul states, Bolivia, Paraguay, Uruguay and northern regions of Argentina.